A microsurgical robot system has successfully performed a new spinal procedure on a cadaver. A surgeon puts a specially-designed threadlike tube into the body through the tailbone area. The tube keeps traveling along the spine and precisely locates the inflamed area to shoot a laser beam at it. A research team at the state-funded Korea Institute of Science and Technology (KIST) has succeeded in the pre-clinical examination of a microsurgical robot, called "Dr. Hujoon", for epidural neuroplasty to treat the spinal pain. Dr. Hujoon consists of a robot arm and a catheter tube with a diameter of three millimeters. The catheter tube is equipped with an optical fiber for illumination, a high-resolution camera and a surgical instrument passage used to inject analgesics or for laser penetration. 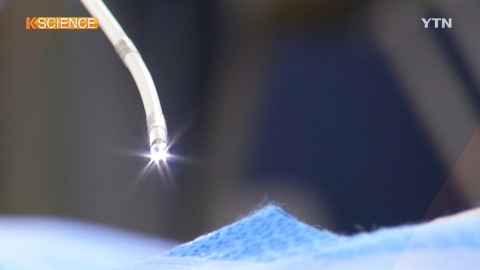 It can be flexed to an S-shape, enabling surgeons to carry out precision surgery. "Upgrading the quality of the camera, we have developed technology which enables surgeons to look at lesions more precisely, and carry out surgical operations by using laser beams or forceps." The surgeon and other staff can remotely control the robot system, so that risks associated with radiation exposure can be reduced sharply. The "Dr. Hujoon" robot system is expected to be used extensively in sophisticated microsurgeries, such as surgeries of brain tumors and eye globes.